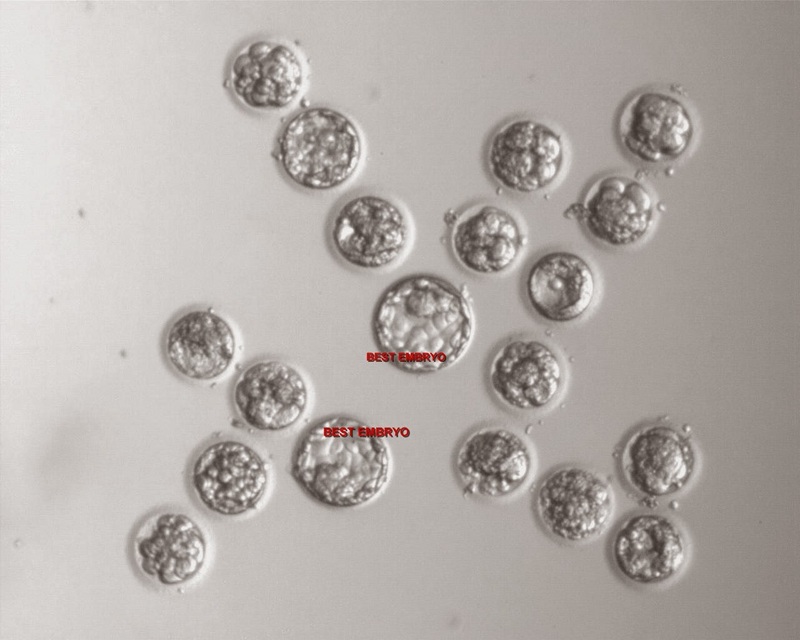 Dr.Malpani's Blog: What Causes Some Embryos to “Arrest”? It’s very frustrating for patients when the IVF clinic calls them and tells them that was a beautiful 4-cell embryo on Day 2 has now arrested on Day 3 and got stuck, instead of dividing further and transforming into an 8-cell embryo. So what is it that causes embryos to arrest in vitro? And why do some embryos that look very promising at the time of transfer, simply fail to implant after transfer ? Even worse, some that implant turn into a heart-rending miscarriage instead of a beautiful baby. The human reproduction process is riddled with inefficiencies , which can cause considerable emotional pain. The truth is that it’s hard to explain scientifically why human reproduction is so flawed. For example, why do men need to produce millions of sperm, when only one swimmer is needed to fertilise the egg ? The one way to make some sense out of this puzzle is that the life expectancy of each embryo is encoded in its DNA. This is a concept we are familiar with when we consider life and death after birth. We know that while some people will live to the ripe age of 100, some unfortunate ones may end up being in the world only till they are 2 years old. For instance, it can be pretty depressing to hear that a 10 year old child dies of leukemia, but life and death is not something we can control. We do know that the commonest reason for embryonic arrest is a genetic problem in the embryo , but this again begs the question - why are there so many genetic errors in these embryos ? Though we try to make sense out of such occurrences and try to rationalize them by using terms such as “lifestyle risk factor” and “heredity”, what is more interesting is a term coined by Dr Manu Kothari- “Herdity”. This means in a “herd” (a population, for example, a group of school children who attend the same class ), the life expectancy can be plotted on a bell-shaped curve. The point at which an individual will figure on this curve is not something we can determine, but this rule of thumb is a useful way of understanding this randomness. For example, you could try plotting the lifespan of your father’s classmates, or that of your family members, to see whether this concept holds water. It means that in a given group of people(the larger the sample size, the more accurately this rule works), a certain proportion will die at a particular age, on account of their genetic predisposition to do so, regardless of what we do. If this concept holds true after birth, is it not logical to expect similar variation before birth too (in the embryonic stage)? Just as some babies will die within 2 hours of their birth and some at the age of 2 years, some embryos arrest (die) within 48 hours, while others may arrest on Day 4. This should be looked at as a continuum that starts from the point of fertilization. In simple words, it means that the life expectancy of an embryo is hardwired into its DNA. Since this is such a random process, that particular embryo could die within 24 hours ; or after 25 years; or may live upto the age of 85. Of course, this relationship is very complex, and there are times when a bad lab might cause the death of good embryos. For example, an embryologist may damage the embryos by handling them roughly; or the incubator may malfunction, causing excessive stress on the embryo which kills them. The simple fact is that, though we would like to, we have not been able to ascertain which factors affect the embryo’s life expectancy. Having a better understanding of this randomness will help to remind is that reproduction is not a very efficient mechanism. This is also why IVF still can’t boast of a 100% success rate, even when everything seems perfect. Our fate is hardwired into our genes , and there is precious little we can do about it at present. Need help in selecting the best IVF clinic? Please send me your medical details by filling in the form at http://www.drmalpani.com/free-second-opinion so I can guide you sensibly!